EmailTray is your personal email concierge. EmailTray tracks all email accounts, predicts what emails are important. Incredibly smart email notifier for all of your Webmail and Outlook accounts. 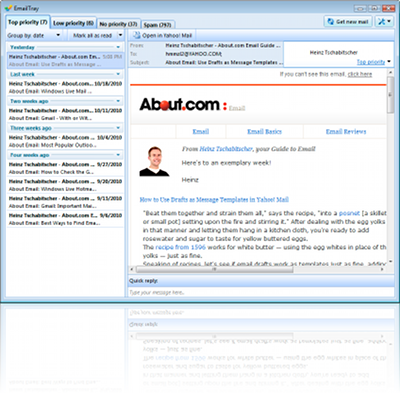 EmailTray Features includee: Manage all email accounts from one place; Have your emails ranked intelligently; Be notified about important mail; Get important messages rescued from Spam; Personal data privacy; Passwords privacy, etc. Get notified about new important emails with a pop-up ticker and sound - even if your Webmail or email client is closed. EmailTray will scan the Spam boxes of all your accounts to recover important messages mistakenly trapped by spam filters. EmailTray will never send the subject lines nor texts of your emails to its servers. Our smart algorithm will help analyze your email behavior locally on your computer. EmailTray will never send passwords of your email accounts to its own servers or anywhere else. The passwords are kept locally on your computer. Control the PC and transfer files with phone, network or ActiveSync connection. Qweas is providing links to EmailTray 2.0 as a courtesy, and makes no representations regarding EmailTray or any other applications or any information related thereto. Any questions, complaints or claims regarding this application EmailTray 2.0 must be directed to the appropriate software vendor. You may click the publisher link of EmailTray on the top of this page to get more details about the vendor.